Hello and happy almost Friday! For a short 4 day week, this one has been dragging for me. Since Monday I’ve been dopey with sinus pressure, a bit tired and dragging through workouts, so I’m looking forward to relax time this weekend. For lunch I had leftover tempeh stir-fry and salad. The stir-fry is topped with nooch and hemp seeds, pretty standard and not too exciting for me I realize. But the avocado-based guac dressing on the salad was great on day 2, no browning or bitterness because of the fresh lemon juice used in it. After work I ventured to our local farmer’s market and came up with a sneaky solution for the No Dogs rule, I carried my pooch in her carrier backpack. And she liked it, got to watch all the people from her safe little carrier away from ogling kids. Good for me since I didn’t have to worry about her getting too nervous and nipping. She’s a rescue and has always been nervous about strangers, especially active kids coming at her. It’s hard because she’s so cute, everyone wants to grab her. Maybe I could get The Dog Whisperer on her. I love the farmer’s market, but it’s on the way home after I pick up my dog, so I always have her with me. Dropping her off at home first takes too long and is out of the way and leaving her in a hot car is not an option. And no, her carrier is not pink with jewels all over it. :-P It’s actually a normal looking camo backpack. Anyway, for $20 I scored pretty good. 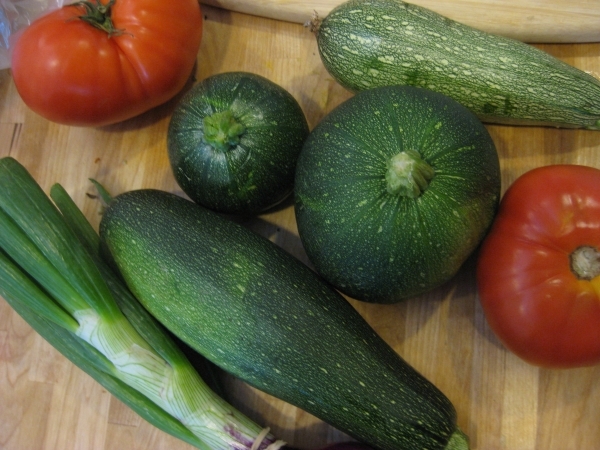 A couple of zucchini varieties including round ones that I’ve never tried, huge tomatoes, fresh red onions, tons of apricots, peaches and fresh figs. That one huge zucchini has spiralizer written all over it! 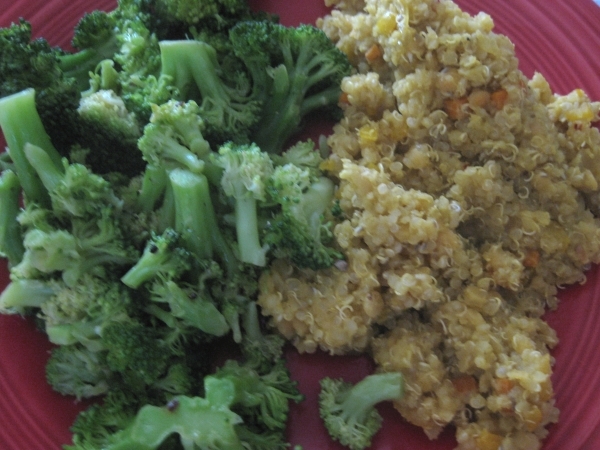 When I got home, I found my husband in the kitchen working away on a vegan dinner of lentils, quinoa and veggies! And for a non-vegan, he did an amazing job! He also received his new running shoes to try out. 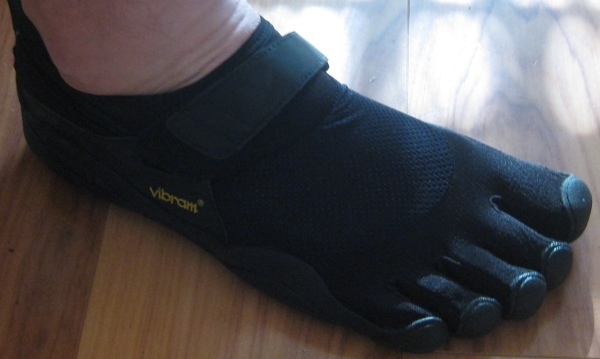 Vibram Five Fingers or un-shoes? He took a test run in them after dinner and reported they pretty much feel like barefoot running and force you to use and strengthen more muscles in your feet. I really want to try a pair, but am too chicken to order them online because of my huge and odd-shaped feet, my 2nd toe is longer than my big toe. So I want to be able to try on different sizes and styles before buying, something I might find time to do this weekend. I heard thos eshoes are cool, def try them out for sure!! Oh love the car ride , Im glad its over!! lol!! Love ya girl and thanks for always stopping by my blog, means alot to me! I try to comment and come to yours as often as I can!!! my feet are a size 12 ladies, yours are not bigger than mine i wouldnt think, so now you know someone w/ bigger feet than you! the market, nice score! 8 ball squash and fruit and yes fatter zukes are totally spiralizer material, all the way! Hi Averie, mine are between a size 10.5 & 11, but anything above a 10 is a PITA to find sizing in! The shoes actually have a thick-ish rubber sole, it’s molded to the foot and toe shape though and hubby said it’s a little weird getting used to the toe feeling at first. There’s a lot of stuff around here that I wouldn’t run in with out good shoes and defo wouldn’t trail run in them. I need to try the nut butter sandwiches with the 8-ball squash from my nieces like you did for Skylar, that was an awesome idea. I’ve heard about those trainers and they sounds awesome but I’m scared of them too. 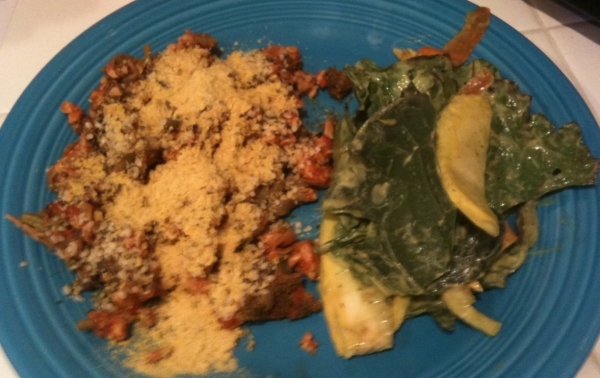 Love that your hubby cooked you a vegan meal, and it sounds delicious. Almost the weekend, woo woo! Those shoes always freak me out a little…but I also want to try them! Yeah, Ella is really weird around little kids too…they make her nervous, which makes ME nervous, so we just try to avoid situations that put her in crowds. me too—–i wear a 10 1/2! love to meet other girls with some feet on them :) love all your farmers market finds. have a great weekend! Those shoes sound really cool but I’m also chicken to try them. I heard the point of wearing them is to get your feet moving from ball –> heel instead of heel –> ball? …but I’m all ball haha. So maybe I wouldn’t benefit too much from them. 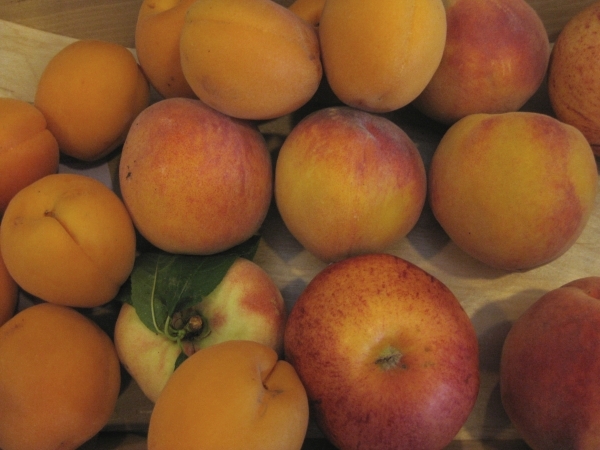 Don’t you just love the farmers market! I actually really like it in the winter when there are less people! That is so awesome that your non veg husband can cook like that. I love my non veg hubby dearly but really all he can make is rice and salad. I’ll take what I can get though! What sushi place do you like? I love Kintaro in Elk Grove.